Osram Opto Semiconductors is adding the new Oslux S2.1 to its portfolio for camera flash applications. 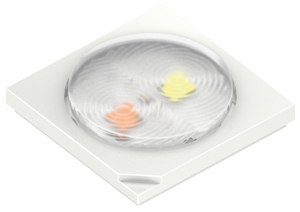 It combines two chips in different colour temperatures, a cold white chip with 6,000K and a warm white chip with 2,250K (Dual-CCT), providing both a multi-chip LED and a lens for the first time. According to the company, this not only saves a work step but also produces excellent results. With a maximum deviation of 300K, the Oslux offers colour fidelity and colour uniformity across the target scene. In video lights and camera flash applications, the integration of two LED chips and a silicone lens on one PC board offers clear benefits for the customer. Now no separate step is necessary for optimum positioning of the lens. This does not only save time but also optimises the use of the generated light. While dimensions of 5.0x5.0x1.15mm make the Oslux S2.1 with its lens slightly higher than predecessor models, it requires less space on the board and has a smaller exposed aperture than two single LEDs, making it compact. The silicone lens also allows this module to be reflow solderable, allowing the module to be easily integrated into standard manufacturing flows. “With the new Oslux S2.1 we were able to achieve very high quality. We have subjected it to both electrical and optically demanding testing and are very happy with the results. It definitely meets our high quality standards,” said Fiona Mak, Product Manager at Osram Opto Semiconductors.